Mitochondria evolved from a bacterial ancestor which, through the symbiosis with an eukaryotic host cell (Margulis, 1970), lost nearly all of its functions as a separate entity over the course of time and became the mitochondrion. However, mitochondria still maintain their own genome, coding for 13 proteins in mammalian cells. Therefore, the vast majority of the mitochondrial proteome is encoded in the nucleus, synthesized in the cytosol and imported into the organelle (Wiedemann et al 2004). As a result, the generation of new mitochondria, also called mitochondrial biogenesis, requires a complex coordination of the nuclear and mitochondrial expression programs. This is achieved by specific nuclear transcription factors that regulate the expression of nuclear genes encoding mitochondrial proteins, such as Nuclear Respiratory Factor 1 (NRF1). Besides transcription factors, there are also co-activators, such as peroxisome proliferator-activated receptor-gamma co-activator 1 α (PGC1α), which also participate as positive regulators in mitochondrial biogenesis (Scarpulla et al 2012). Due to the central role that mitochondria play in cellular homeostasis, it comes as no surprise that alterations in mitochondrial functions are present in a wide variety of diseases. In this preprint, the authors have taken a close look at mitochondrial dysfunction in two lysosomal storage diseases: Niemann-Pick type C (NPC), caused by mutations in genes that encode proteins involved in efflux of lipids from the lysosome; and shingomyelinase (ASM) deficiency, caused by mutations in the gene encoding ASM, which catalyzes the degradation of sphingomyelin. The authors uncovered specific down-regulation of mitochondrial transcripts in both NPC and ASM deficiency, pointing at altered mitochondrial homeostasis as a common mechanism in lysosomal storage disorders. Despite the transcriptional repression, mitochondrial mass was increased in fibroblasts from NPC and ASM patients. This can be explained by the lysosomal loss of function present in lysosomal storage disorders, which leads to accumulation of cargoes normally degraded by this organelle, such as mitochondria. Mitochondrial dysfunction, characterized by increased ROS production and decreased mitochondrial respiratory capacity, was also present in patient’s fibroblasts, probably due to the accumulation of dysfunctional mitochondria. Next, the authors wondered which transcriptional regulators could mediate the repression of mitochondrial-associated genes. Upon analysis of the promoters of those mitochondrial genes whose expression was repressed, they found two transcription factor families, Krueppel-like factors (KLF) and ETS factors that were enriched. Specifically, KLF2 and ETV1 transcription factors showed increased activity in brain and liver from NPC KO mouse. To further determine whether KLF2 and ETV1 were repressing mitochondrial biogenesis, the authors knocked down both genes independently in ASM-deficient fibroblasts, which rescued the transcript levels of mitochondrial proteins that were downregulated, including important mitochondrial biogenesis regulators such as NRF1, its downstream target TFAM, and NRF2. Although silencing of KLF2 and ETV1 partially rescued mitochondrial respiratory capacity, lysosomal function remained impaired. The next question to tackle was the relationship between KLF2 and ETV1. The authors found that KLF2 is located upstream of ETV1 and can modulate ETV1 expression. Moreover, Erk signaling is necessary for KLF2-dependent activation of ETV1. And what about KLF2 regulation? KLF2 turns out to be part of a signaling network of sphingosine-1-phosphate receptor 1 (S1PR1), by which KLF2-mediated transcriptional activation of S1PR1 acts as negative regulator of KLF2 activity. Interestingly, inhibition of S1PR1 leads to increased KLF2 expression, repression of mitochondrial proteins and altered mitochondrial oxygen consumption rate. However, when treating ASM-deficient fibroblasts with an S1PR1 agonist no changes were observed. Indeed, ASM-deficient fibroblasts display decreased levels of S1PR1 receptor in the plasma membrane without any changes at the protein level, suggesting that S1PR1 mislocalization leads to increased KLF2 signaling and its downstream consequences. Importantly, KLF2 and ETV1 upregulation represents a protective mechanism in ASM-deficient fibroblasts, since the silencing of these two mitochondrial biogenesis repressors leads to increased cell death. Schematic illustration of sphingosine-1-phosphate (S1P) signaling. S1P is synthesized inside the cell and transported to the extracellular space through S1P transporter. 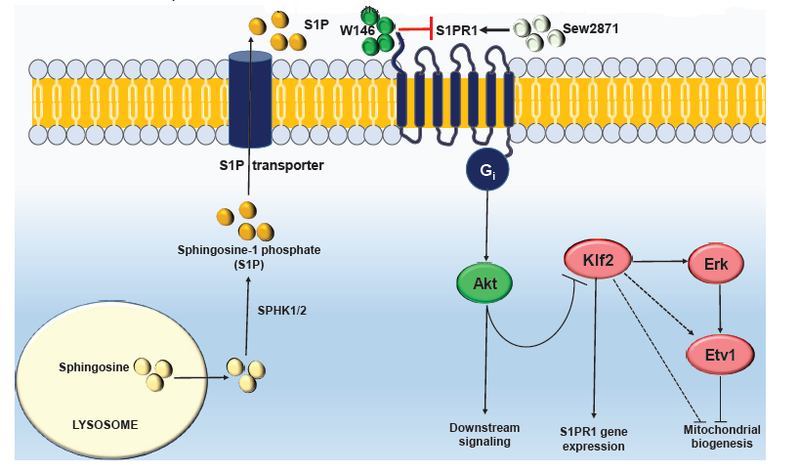 Extracellular S1P activates sphingosine-1-phosphate receptor 1 (S1PR1), which triggers Akt downstream signaling, including KLF2 repression. Upon loss of S1PR1 receptor and/or S1P signaling, KLF2 is activated and can induce its downstream targets, leading to repression of mitochondrial biogenesis. In the field of mitochondrial biology, there is this assumption that mitochondrial biogenesis relies on a subset of transcriptional factors and coactivators that positively regulate the mitochondrial transcriptional program. But less is known about repressors of mitochondrial biogenesis. This preprint sheds light on the existence of mitochondrial transcriptional “brakes” which could also play a role in mitochondrial disorders and neurodegenerative diseases characterized by mitochondrial dysfunction. Another key aspect of this preprint is the underlying idea of the importance of organelle crosstalk in health and disease. This organelle communication can take place through membrane-membrane contacts or involve complex cellular signaling. In any case, it is clear that alterations in any component of the network can have important consequences for other elements, as it is illustrated in this preprint showing that lysosomal dysfunction gives rise to mitochondrial biogenesis repression. 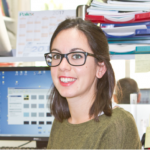 The authors showed how in conditions where lysosomal function is impaired and mitochondria are not being degraded, there is a shutdown of mitochondrial biogenesis. This repression seems to be orchestrated by the internalization of S1PR1 and decreased sphingosine-1-phosphate signaling, which in turns activates KLF-2 and its downstream transcriptional program. Which mechanism is responsive for S1PR1 internalization? Silencing of KLF2 and ETV increases mitochondrial biogenesis and partially normalizes the mitochondrial respiratory capacity in ASM-deficient fibroblasts. However, no improvements are observed regarding lysosomal function. Is the increase of mitochondrial biogenesis compensating for the damaged undegraded mitochondria accumulated in the cytosol? At the same time, silencing of KLF2 and ETV1 in ASM-deficient fibroblasts leads to increased cell death, pointing at KLF2 and ETV1 activation as a protective mechanism in ASM deficiency. Does this imply that the mitochondrial dysfunction observed in lysosomal storage disorders minimally contributes to the disease. Margulis, L. (1970). Origin of eukaryotic cells. New Haven (Connecticut): Yale University Press. Scarpulla R. et al. Transcriptional integration of mitochondrial biogenesis. Trends Endocrinol. Metab. 23, 459-469 (2012). There are two possible explanations for the decreased levels of S1PR1 at the plasma membrane. One would be that recycling of the receptor is be impaired, i.e., the receptor would be internalized upon binding to its agonist but not efficiently returned to the plasma membrane, possibly due to defects in endosomal recycling- a pathway that is tightly linked to the lysosome. The other possibility is that there are perturbations in the secretory pathway that preclude its normal delivery to the plasma membrane. Silencing of KLF2 and ETV1 increases mitochondrial biogenesis and partially normalizes the mitochondrial respiratory capacity in ASM-deficient fibroblasts. However, no improvements are observed regarding lysosomal function. Is the increase of mitochondrial biogenesis compensating for the damaged undegraded mitochondria accumulated in the cytosol? Our data suggests that the increase in mitochondrial biogenesis seems to be sufficient to improve mitochondrial respiratory chain activity. While it is likely that many of the mitochondria that are accumulating in the cytoplasm due to defects in autophagy are impaired, it is possible that there is also a population of relatively healthy (i.e., able to maintain the electrochemical gradient across the inner membrane) which would be import-competent for new proteins and thus whose activity might be enhanced. At the same time, silencing of KLF2 and ETV1 in ASM-deficient fibroblasts leads to increased cell death, pointing at KLF2 and ETV1 activation as a protective mechanism in ASM deficiency. Does this imply that the mitochondrial dysfunction observed in lysosomal storage disorders minimally contributes to the disease? When we found the perturbation in mitochondrial biogenesis, one key question was to understand the advantage or disadvantage of this event. Our data suggests that reduction of KLF2 and ETV1 to control levels is detrimental, suggesting that the up-regulation of these proteins is beneficial. We cannot, however, conclude that this is exclusively due to the regulation of mitochondrial biogenesis, as the roles of KLF2 and ETV1 go beyond that aspect. It can be speculated that the lysosomal defects are interpreted by the cells as a defect in the recycling center, and therefore a program of reducing the production of recyclables (e.g. mitochondria) is activated. Reduction of KLF2 and ETV1 reactivates the production of mitochondria, which may eventually result in increased need for mitophagy and therefore in aggravation of the lysosomal storage. This is one aspect that we will investigate in the context of future projects.